Near about 10000 govt jobs have been announced by leading recruiting bodies today (6 December). Govt job aspirants must make much of this opportunity and start applying right away. Highest numbers of vacancies have been declared by Directorate Family Welfare Uttar Pradesh (5628 vacancies for health worker-female). Applications have been invited from 10+2 pass candidates with registered with Uttar Pradesh Nursing and Midwife Council, Lucknow. Candidate must have also completed 06 months Basic Health Worker Course form Uttar Pradesh Nursing and Midwife Council, Lucknow. 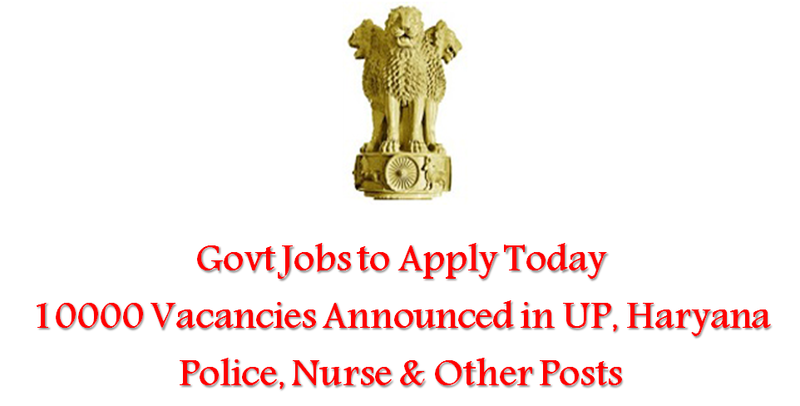 Job vacancies have been announced in Uttar Pradesh Power Corporation Limited (UPPCL) for Office Assistant & Steno posts, as well. Graduates can apply to these posts. With more than 8000 vacancies announced in the State, this is going to be no less than a jackpot for all job aspirants in Uttar Pradesh. Candidates are suggested to go through the eligibility criteria properly and then start for applying right away. Likewise 943 vacancies have been announced by Haryana Staff Selection Commission (HSSC). Recruitment is open in the posts of Laboratory Assistant, Industrial Extension Officer, Technical Assistant (Chemical), Legal Assistant Industrial Extension Officer (headquarters), Operator Grade II, Technical Assistant (of Mechanical), Operator Grade-I and Other in various government departments of Haryana. Indian Bank has also released official notification for recruitment of Probationary Officers (324 vacancies). Applications have been invited for 1 year Post Graduate Diploma in Banking and Finance (PGDBF) course to be conducted at Indian Bank Manipal School of Banking (IBMSB) for recruitment of Probationary officer. The Indian Bank in partnership with Manipal Global Education Services Private Limited (MGES), Bengaluru will be conducting PGDBF, to provide training in Banking and Finance to prospective candidates aspiring to join Indian Bank as Probationary Officer. If you are looking for police constable jobs, you can apply against 521 vacancies in Odisha Police. Odisha SSC has invited applications for recruitment on behalf of the Odisha Police’s to the post for Constable under 9th India Reserve Battalion (Specialized).